One of Mr Monkey's favourite series of books is the Greywalker series written by his friend Kat Richardson, and he always looks forward to reading more adventures of the ghost-spotting, vampire-annoying, poltergeist-quelling heroine, Harper Blaine. 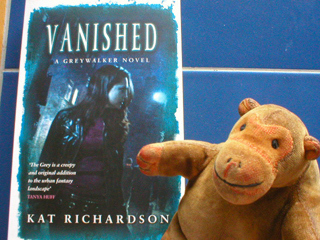 Mr Monkey knew that the fourth book in the series was going to be called Vanished and that much of the action would take place in London, because Kat had asked him about creepy places in London when she visited for research and a booksigning in May 2008. 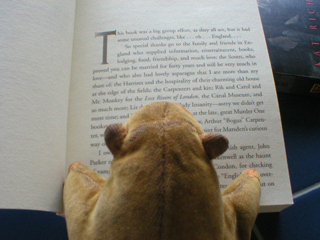 The book came out in the UK recently (ISBN 978-0-7499-4076-8, published by Piatkus, £7.99 from all good bookshops), so Mr Monkey rushed out and made his humans buy him a copy. "Rik and Carol and Mr Monkey for The Lost Rivers of London, the Canal Museum and so much more;"
That's Mr Monkey mentioned in a real book by a real author. And it's a very good book, too. You can read about Kat Richardson's books at her website and find out what she's doing at her blog.